The F430 GTC sports car of 2006-2010, developed by Michelotto, despite only 50 being built, turned out to be, according to its customers, one of the most popular racers built by Ferrari. 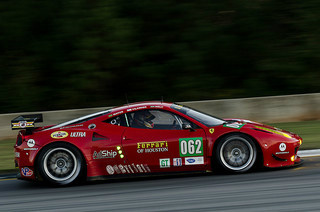 The Ferrari 458 Italia GT2 was introduced in 2011 as the latest GTE class racer. The front splitter fitted to the road variant was replaced, in the GT2, with a more standardised inlet in which air was channelled out by way of louvres situated in the bonnet. As a result of new ACO rules relating to air restrictors that had to be fitted to the engine, the output developed from the 4.5 litre, V8 engine was reduced to 464 bhp, which was substantially down on the 570 bhp from the 458 Italia and 458 Challenge sports cars, although still marginally up on that of its predecessor, the 430 GTC's 445 bhp. Furthermore, the 458 Italia developed its output at the redline of 9000 rpm, whilst that of the GT2 was limited to 6250 rpm. However, this did not adversely affect torque, which was maintained close to the 398 ft/lbs of the road variant. 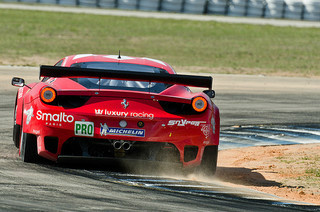 The 458 GT2 had a kerb weight of 1245 kg, which was 243 kg lighter than that of the 458 Italia. The new rules did allow the use of a six speed F1-style paddle shift gearbox, but not linked to a double clutch system as in the 458 Italia. In the final analysis, some GT2's used, instead, a conventional manual gear stick version. Notwithstanding such reductions in the cars performance, the FIA GT Championship was very much a test of the skill of the driver as well. 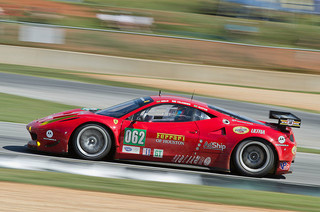 In terms of its race credentials, the 458 Italia GT2 won both the 2012 and 2014 Le Mans 24 hour race, and the 2012 12 hour race at Sebring, along with a clutch of other place wins.